BASEBOARD ALWAYS WARM | TACO FLOW CHECK | Solved That! BASEBOARD ALWAYS WARM – It was an exceptionally warm day in November when we did a second walk through of our home with the home inspector. It was nearly 60 degrees which was a little unusual but not unheard of here in Connecticut. The house that was another story. It was quite warm inside, in fact bordering on hot. The current owner and I noticed that the hot water baseboard registers were warm despite the thermostat being set to 50. In his expert electrician opinion the thermostat was defective and said it would be replaced. I found his conclusion interesting but I was distracted and paid little attention to the insignificant thermostat. Fast forward to the house closing and true to his word the homeowner replaced the thermostat. December 11, 2016 it was a balmy 70 degrees. The interior of the house was well over 80 degrees despite the brand new HONEYWELL THERMOSTAT being set to 50 degrees. I decided to check the baseboard and low and behold the baseboard was warm. Unfortunately now this became my problem. While Im not plummer or heating professional I am in charge of maintenance for a manufacturing facility and that job requires I know a little about a lot. I headed down to the boiler for investigation. I immediately noticed every pipe leaving the boiler circulator pumps had a green valve. While not familiar with plumbing hardware brands and model numbers I was familiar with how these devices we being used. These devices are called “FLOW CHECKS” or “CHECK VALVES“. What do “FLOW CHECKS” or “CHECK VALVES” do? Their purpose is to allow water to flow through your heating system in one direction and only flow when the circulator pumps are running. Their secondary function is to prevent water from flowing when the circulator pumps are not running. Imagine a weighted flap inside. When the circulator pump turns on the water pressure pushes the flap open allowing the heated water to flow to your baseboards. When the circulator pump turns off the water stops flowing and the valve closes. So this brings us to the topic of this post, “BASEBOARD ALWAYS WARM“. One of the ways “FLOW CHECKS” or “CHECK VALVES” fail is they don’t close or seal properly. Now think about what you know about hot and cold water. Hot water rises and cold water sinks. If the “FLOW CHECKS” or “CHECK VALVES” are not closed the water will continue to circulate slowly even when the circulator pump is off. 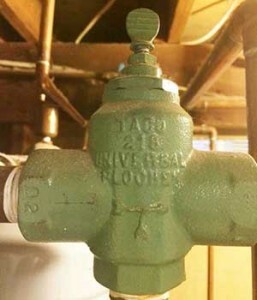 The easiest way to tell if the “FLOW CHECKS” or “CHECK VALVES” are functioning properly is to feel the pipe above and below the “FLOW CHECKS” or “CHECK VALVES“. The circulator pump side should remain the temperature of the boiler. The pipe above the “FLOW CHECKS” or “CHECK VALVES” should eventually feel cool.